In the grand spectrum of sandwiches, the egg salad sandwich doesn’t attract the praise it deserves. Maybe it’s because too many of us have had a bad run-in with a gloppy, tasteless egg-and-mayo-based creation in our past. Now’s the time to push those bad memories aside using a recipe for a far superior sandwich. Down in Nashville, Tennessee, culinary director Josh Habiger has helped create an egg salad capable of restructuring how you think about the food itself. First, he skips the mayonnaise and opts instead for extra virgin olive oil, which lends the mixture an almost silken texture. Next, he cranks up the bright, fresh flavors of the salad by adding lemon, herbs, and fennel, a crunchy bulb that delivers a faint licorice taste. Finally, he tosses in grainy mustard and pickle relish for tang and a hit of smoked paprika for a depth charge of campfire-like aroma and flavor. 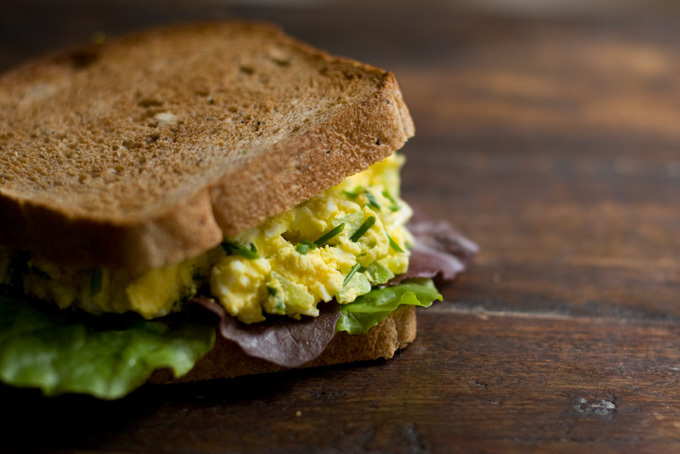 The egg salad works equally well stuffed between two slices of hearty whole wheat bread or scooped atop a salad of mixed greens. And, because it makes a fairly big batch, you may also be tempted to eat a spoonful right from the container for a snack. Go ahead. We won’t judge you if you do. 1. Fill a medium sauce pot with water and bring it to boil. Carefully lower the eggs into the water with a slotted spoon. Boil the eggs for 11 minutes and then transfer them to an ice bath. Allow the eggs to cool completely. Then peel and dice the eggs. 2. In a large bowl, mix the eggs with the rest of the ingredients and season to taste. Makes 6 servings. *If you find a fennel bulb with the stalks still attached. Pick the fronds and replace them with the dill in the recipe, if desired.